The Vocal Library High Voice. Arranged by Maria Di Palma and Richard Walters. Vocal Collection. Spanish. 216 pages. Published by Hal Leonard (HL.740147). ISBN 0634029223. 8.5x11 inches. Edited by Maria Di Palma & Richard Walters. 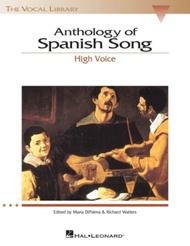 I purchased the Anthology of Spanish Song plus the music accompaniment CD's. The songs are beautiful and the keys are great for a high soprano voice! I am looking forward to performing the songs!! 31 of 53 people found this review helpful. are not widely available in the U.S. Some of the song translations are misleading in their representation of the song text.